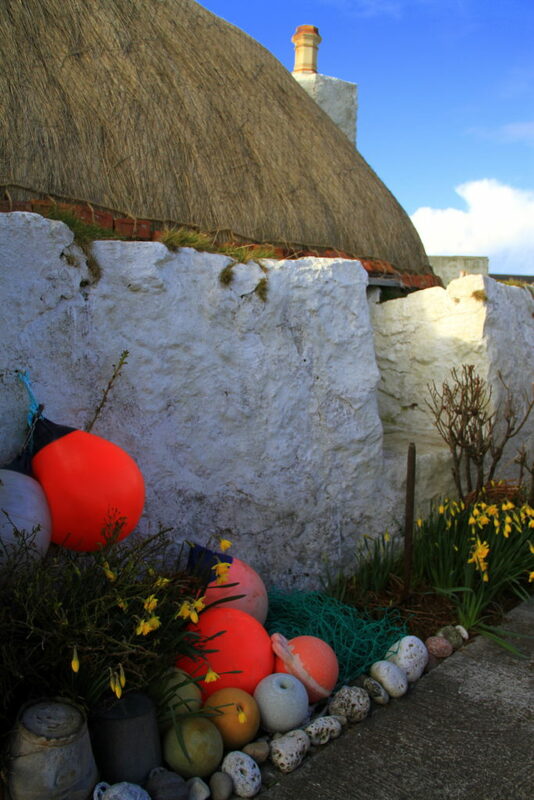 Gardening is a bit of a challenge on Tiree; something I’ve learned the hard way. Each spring, I wring my hands impatiently – waiting for the bulbs lurking my boarders to flower. I live in a traditional thatched cottage, with white-painted stone walls several feet thick. When the daffodils and tulips open, their deep bird’s-eye red and Crayola yellow is a shot in the arm after winter’s beigeness. I get about 48-hours to enjoy my flowers. As soon as they appear, I scramble for the camera and make excuses to stand outside, chain drinking cups of tea and staring at them. The salt wind curls and browns the petals so quickly. It’s really better to cut them and bring them indoors – though I hate to do it. This year I had planned to add more bulbs; excitedly contemplating the future horticultural spectacle. It didn’t work out. 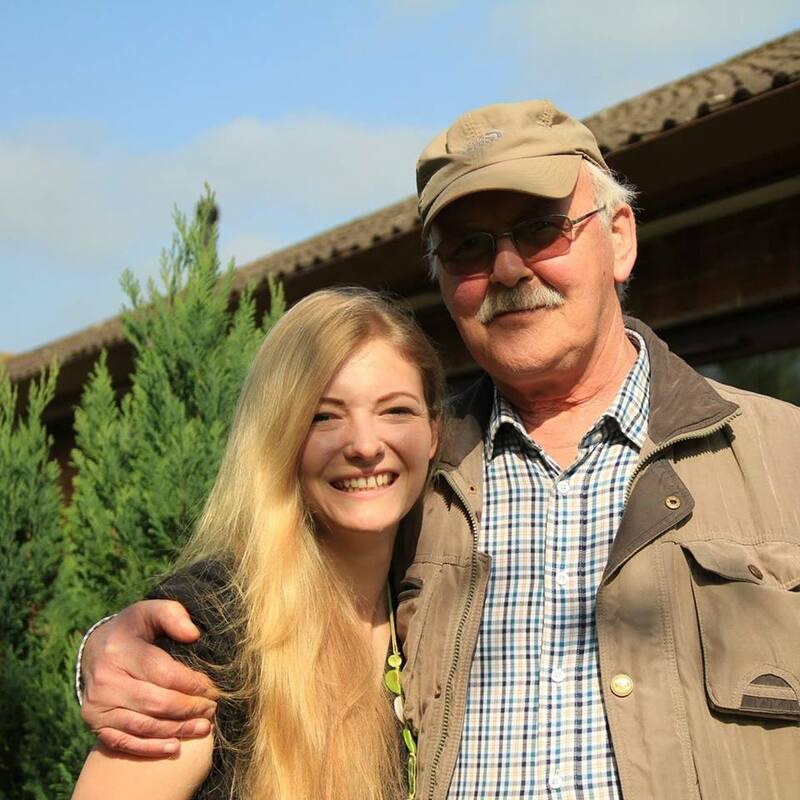 My father died unexpectedly at Christmas, and there wasn’t enough time for me to leave Tiree when I got the call. I hadn’t seen him in person for almost a year; but we buried him next to a wildflower meadow. I don’t know what it looks like in bloom. Once I returned from Cheshire, the time for planting had passed. I was thrown into an unusually busy summer, tainted by a loss that I didn’t have time to address. The season of 2018 was consumed by project work, by deadlines, by problems – with only short windows of respite. This hard work is ongoing. We have been conditionally awarded £131k from Visit Scotland’s Rural Tourism Infrastructure Fund, towards the upgrade of three beach carparks and an extension of the parking area at The Island Centre. However, this only covers around 60% of project costs, so an application to LEADER is underway. Further capital support has also been secured from Argyll and Bute Council, Scottish Natural Heritage, Tiree Community Business and Tiree Community Windfall Fund – for which I am very grateful. Argyll Community Housing Association and Argyll Estate are further supporting our efforts with vital in-kind contributions; all of which are valued and appreciated. 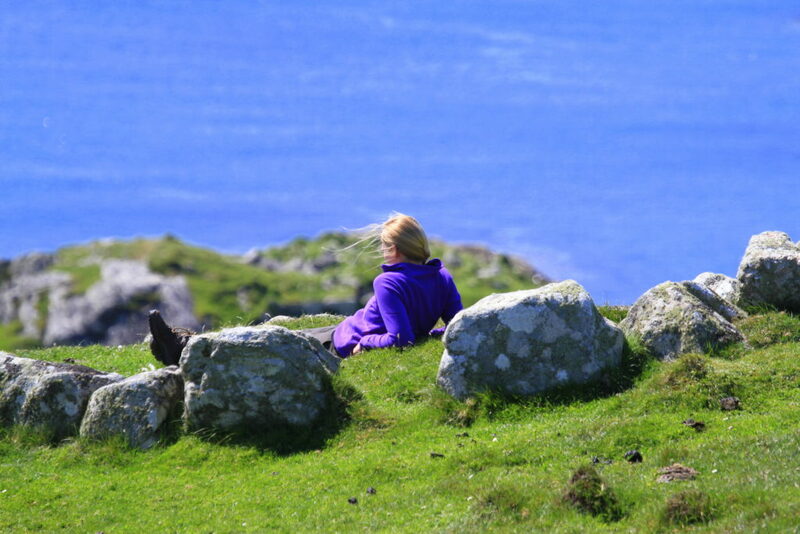 There were afternoons when I felt so drained, all I could do was sit on Ceann a’ Mhara and stare blankly at the Fulmars. 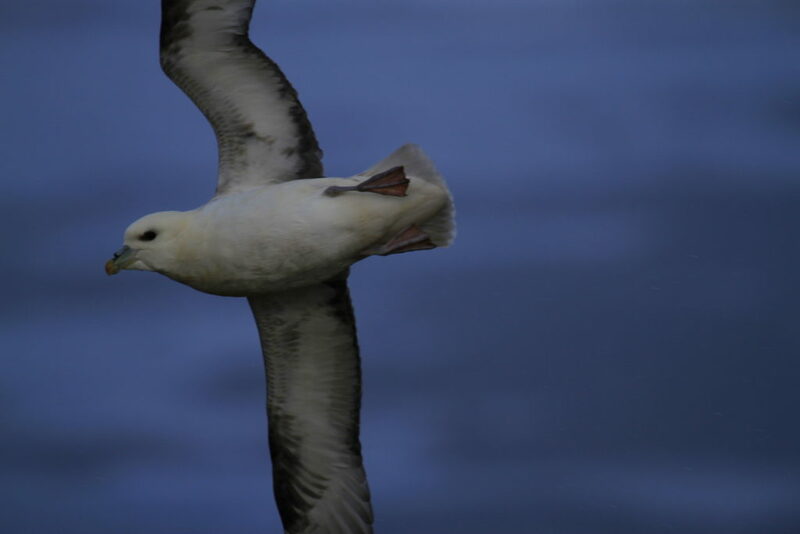 But the gift of the Fulmar is that it stares back. You can try to be there in body and not in mind; Fulmars just won’t let you do it. Each time they sweep past, making the most of swirling updrafts that scream over the face of the cliff, they catch you and return you to yourself. The Ceann a’ Mhara Fulmars are my near neighbours in Barrapol. I’ve been sending internal postcards all year. Most of it was too busy to remember – but the days that broke through the fug were glorious. I can see them so clearly, I might as well have them in my hand. It was the first time I found the fishing hole. The first time I found a worked flint blade. The first time I saw a Common Dolphin calf. The first time I saw Basking Sharks breaching. The first time I managed to get a photograph of the blasted Flag Irises, in the annual two-hour window where they’re all in bloom but the wind hasn’t flattened them yet. 2018 hollowed me out, and then filled me up. Another of my favourite spots, this time on Ben Hynish (I’m in competition with Dr Holliday for this one though!). When people die, we don’t know what will seep into the space they leave behind. Sometimes, it’s a sense of injustice; perhaps even resentment or anger. It has taken me almost twelve months to know the answer for myself. The rose bush in my garden is waving the white flag. Its other, late-growing buds are turning brown and sodden. But next to the haphazard stamens of that last flower, a single petal has managed to cling on. It will be the final colour in my garden this year. The swans have come back; our nights are split with electric green; and I see that my space has filled with nothing but fond memories, flowers and Fulmars. Only one island could help me do that.